Fluoxetine hydrochloride (3-(p-trifluoromethylphenoxy)-N-methyl-3-phenylpropylamine HCl) was first described in a scientific journal in 1974 as a selective serotonin -uptake inhibitor. It was licenced for use in the treatment of depression in Belgium in 1986 and the USA in 1987. Before its launch, to introduce it to the public, its manufacturer Eli Lilly funded eight million brochures (“Depression: what you need to know”) and 200 000 posters. It would become one of the best selling pharmaceuticals of its age; by 1992 annual sales had reached US$1bn and by 1995 they had doubled to US$2bn. In 1999 ‘Prozac’ – the trade name of fluoxetine – was named on of the ‘Products of the century’ by Fortune magazine. The impact of the drug is hard to overstate, both in terms of the culture of the treatment of mental health disorders and in Western society at large. Prior to the introduction of fluoxetine antidepressants had a reputation of having side effects and were cautiously prescribed as they were toxic in overdose. Fluoxetine, on the other hand, was relatively benign and its introduction practically created a market in drugs for mood problems that could be safely prescribed to anyone who wanted them. Other SSRIs followed in fluoxetine’s wake and the result has been an explosion in the diagnosing of depression and the prescribing of antidepressants. This is all the more incredible when one considers that the revenue from antidepressants sales in 1975 was US$200million and the market was considered to be saturated. ‘Prozac’ has since entered the popular lexicon and spawned its own sub-genre of literature. Of these perhaps the best known is Prozac Nation, a bestselling – but in my view rather tedious – memoir of mental illness written by Elizabeth Wurtzel. 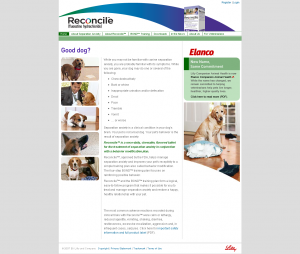 In 2007 Eli Lilly began to market fluoxetine for dogs under the name Reconcile. In this incarnation it’s chewable, tastes like beef and is intended to treat something called ‘canine separation anxiety’. This disorder amounts to a set of behaviours displayed by a dog when being left alone for too long. A dog so affected may urinate in inappropriate places or chew furniture. At the time of launch Lilly said that their research showed the up to 17% of dogs suffered from this behavioural disturbance. Reconcile comes in a once a day chewable beef flavoured capsule. In Britain, research among pet-owners carried out for Sainsbury’s Bank in 2003 indicated that 632,000 dogs and cats had suffered from depression in the previous year. Nearly three times as many pets had suffered from behavioural problems that which could be linked to depression, often resulting in the animal damaging its home or becoming moody or aggressive, according to the research. The experience of a human disease such as depression involves complex human attributes such as thoughts, emotions and language. To suggest that we can extend the concept of a specific human mental illnesses such as depression to dogs is to stretch the paradigm almost to breaking point and shows at once how loosely lay people apply the concept and how engrained widespread mental illness it is in everyday thinking. Not that this association will worry the pharmaceutical companies. Marketing antidepressants to dogs tacitly encourages dog owners to consider that their dogs have mental health conditions previously described in humans and this can only be good for sales. Many pharmaceuticals develop mission creep whereby manufacturers endeavor to win them licences to allow their use to treat disorders distinct from those for which they were initially licenced. Initially cleared for depression only, Fluoxetine is now used for anorexia and bulimia nervosa, obsessive compulsive disorder, panic disorder, premenstrual dysphoria and generalized anxiety disorder. Viewed in this light, the launch of Reconcile, and fluoxetine’s crossing of the species barrier, is just part of the drugs product lifecycle. This is not to say of course that fluoxetine doesn’t have its uses for animals. In similarity to human subjects it may have impressive effects in some, moderate for others and no effect for a substantial number. The emphasis is on the problem being in the dog and nowhere else, just like in humans. men in white coats n. (a) medical or laboratory staff, esp. doctors; (b) psychiatrists or psychiatric workers, usually (with humorous exaggeration) referred to in order to imply a person’s supposedly imbalanced or deluded state of mind. 1961 W. FENNELL Dexter gets Point 135, I think I’d better phone the man in the white coat.] 1967 L. ANDREWS Hosp. Circles ii. 33 He did not wake when the usual procession of night sisters and men in white coats came in and out. 1968 D. HELWIG in Sat. Night Mar. 37/3 They’re going to put you in jail, do you know that? Or they’re going to send the men in white coats for you. Of these the third by Helwig would be the most recognizable in the vernacular. I’ve no idea who he or she is or was. They’re coming to take me away ho ho hee hee ha haaa! And they’re coming to take me away ha haaa! 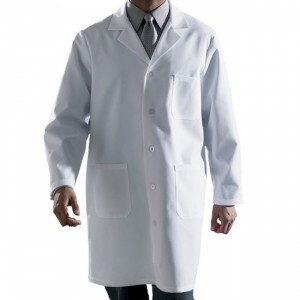 I’ve actually never worn a white coat as a doctor, although I was forced to wear one as a student. More socially, I did wear one on the 2007 RemedyUK London March and made it onto the background of a report on Channel 4 news to other people’s hilarity. This aside, they’re uncomfortable, hot and unless changed every day, potentially rather dirty. I suspect that doctors used to wear them to give themselves an air of professional expertise and that their demise has been as much about fashion and the breaking down of barriers between healthcare professions as much anything else. If anyone knows any more about the use of white coats in psychiatry, then please comment below. Corduroy suits – don’t do it kids! Where I work there are several psychiatrists who wear corduroy suits. Most of them are consultants, but one or two are junior colleagues of mine. For the moment these pretenders are wearing a jacket only, which suggests the possibility that this is a disease that spreads from the top down. Not one to keep a gnawing question to myself, I was at an academic meeting when I decided to tackle one of our registrars on this subject. He’s normally got a sense of humour and so I thought I was on safe ground. ‘Do you own a corduroy suit?’ I ventured. He looked displeased. I realised that I had blundered; I didn’t dare talk to him again for the rest of the evening. But, why in these days when psychiatrists might wish to be seen as approachable and patient centred, do we seek to distance ourselves from the rest of the human race by our penchant for such disastrous apparel? The word is that people consider the corduroy is worn by ‘relaxed’ people. People who are approachable and trustworthy. They are non threatening and put people at ease. So our taste for corduroy brings us closer to our patients. Which sounds pretty good, and maybe I’ll get one after all. But it’s quite a lot for a suit to live up to.